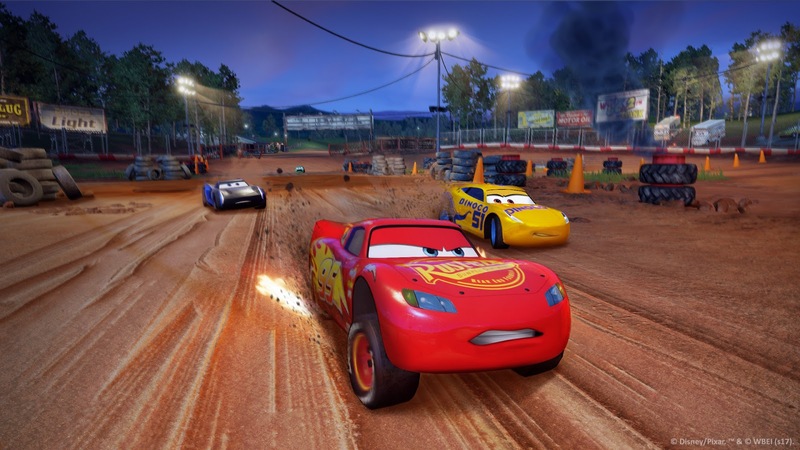 Based on the Cars 3 film, we go away from the packed stadiums and hit the off road, but for a racer is Cars 3: Driven to Win fun to play? 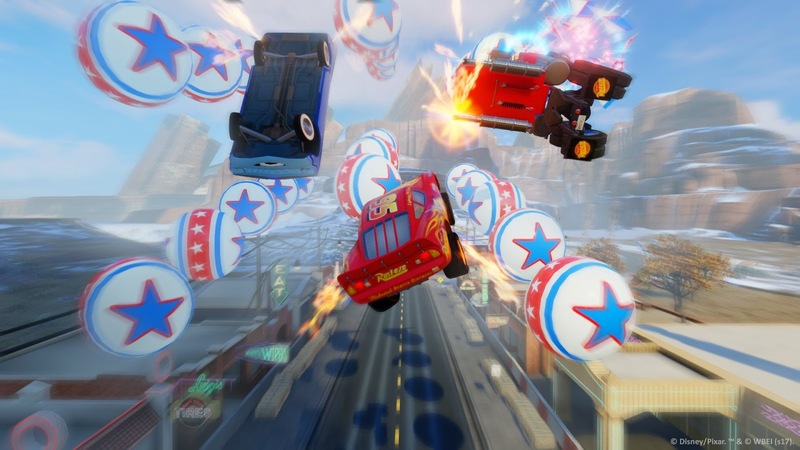 Cars 3: Driven to win looks to expand the story line of Cars 3 with this arcade style racer while basic at first, can be hard to master. To kick things off we are treated to a tutorial of sorts where we see Lightning McQueen and Cruz Ramirez trying to keep up with legendary racers. The point of this was to learn some of the basic mechanics such as jumping and drifting, but it also gave the tutorial a little extra push to it, which I did enjoy. 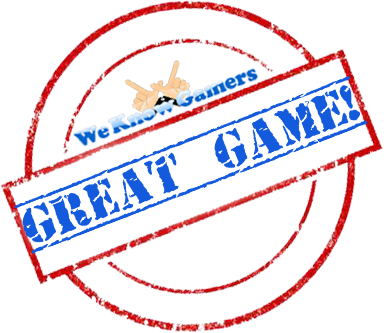 There are many different types of events to enjoy, but the main gameplay aspects are prevalent across all of them. Of course races consist of doing a certain number of laps and reaching the finish, however Cars 3: Driven to win adds in a little extra to add some more excitement to it. At the start line in most games you wait for the right moment to hit the accelerator, but in this game, you are mashing that button to get the car itself revved up. The higher rev you reach, the bigger boost you get starting off which I found really interesting. Boost itself can be acquired by picking up the nitro tanks dotted around a course or by performing skills. These skills comprise of drifting around corners or doing tricks while in mid air. You also get boosts for hitting all the arrows when drifting, driving on two wheels or by driving backwards like a show off. There are many ways to accomplish this and the actual race tracks themselves help with that. There are special arrows that you will find on certain routes and when you cross them by either drifting, driving on two wheels or driving backwards, it'll give you the extra kick to your nitro and I can't tell you how important these became; especially when it came to coming in first or 2nd. The tracks are multi layered as well, so it won't be just a single route. I found it interesting that the AI always took a better route than me on the initial play through and it baffled me when I saw myself drop a couple of places instantly due to that. Other modes include a Grand Prix style cup which has you go through multiple races in a tournament. The Stunt Showcase where you perform mid air tricks to gain points. There will be balloons floating in the air for you to nab those extra points and once the time runs out, its tallied up. Takedown is pretty self explanatory, however in this case instead of it being a standard race where your goal is to take out the AI and finish first, this time the only objective you have is to take out the AI period. You will have an overall time limit and during that time there will be a wave of AI that you will need to take out. This will be done by picking up weapons as you're driving along. This varies from a rocket launcher to a machine gun, however the kind of weapon you get will depend on luck. At certain points there will be an AI that starts glowing gold for a certain amount of time, take them down to earn the extra amount. 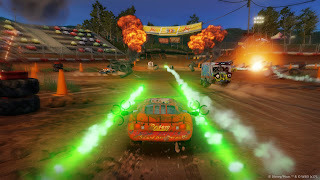 Battle Race is a mix of both race and takedown in which weapons are allowed. The only thing that matters is taking out your enemies and coming first place. Playground allows you to simply drive around freely in an open area which will be full of ramps, weapons and great places to jump of off. Included in here are optional challenges you can complete to further improve yourself. Split screen co op is also available and with a game like this, I can imagine it'll be lots of fun having mates around to give it a go. Bringing all this together are skill checks or goals in the Hall of Fame. Completing certain objectives such as getting a first place finish or driving backwards for a certain amount of time will unlock these and earn experience towards the overall Hall of Fame. The more you complete enables you to unlock new characters, challenges etc. 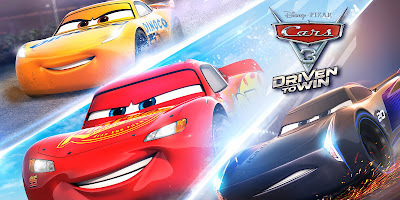 Overall I actually enjoyed playing Cars 3: Driven to Win. There is always this idea that with games that have taken a movie licence in which most cases, usually ends up pretty bad, but I can gladly say I had a good time. The races were challenging, especially finding the right time to pull off some off the tricks to gain more boost and there were a variety of modes to keep you interested. The AI really give it to you from the beginning, but its something you can overcome the more you play. Interestingly, you can even customise each car with various unlockable horns, lights, and boost flames, letting players put a slight spin on their vehicles.